300 White Non-Wrap OnLine Diskette Labels, 2-11/16" x 2"
Printable with either Laser or Ink Jet Printers, these top quality labels are manufactured of white, smudge-proof, non glossy stock with permanent acrylic adhesive. Although originally designed for diskettes, these labels may be used for any purpose where a Permanent label of this size is appropriate. 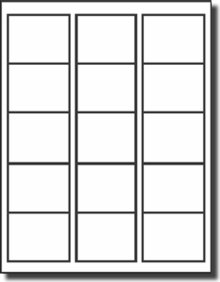 Each label is 2-11/16" x 2", and there are 15 labels per sheet. Each package contains 300 labels.